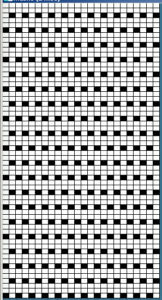 This repeat appears in my pre punched factory basic packs as both #17 and #20. 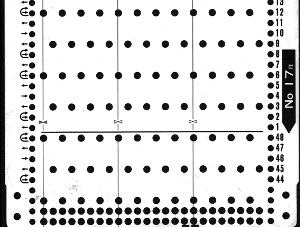 The lace carriage is used for 2 passes and then for 4 alternately, as indicated on the left side of punchcard. 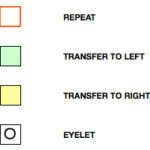 The 2 passes will make transfers to left, the 4 make transfers to right. 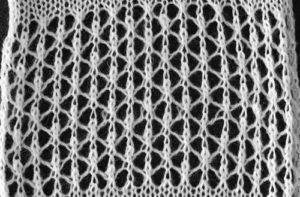 See previous lace posts for further info on lace selection methods and accompanying charting. 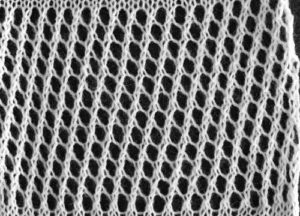 The above swatch and the one below are similar, transfers occur in the opposite direction, so vertical columns of stacked stitches occur in the alternate columns of the finished fabric. 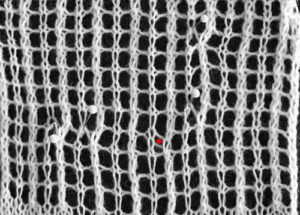 I had some transfer issues in similar spots in both fabrics, have not analyzed the possible direct cause. 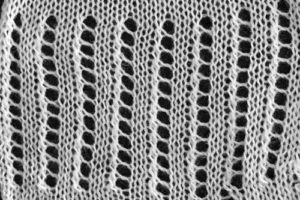 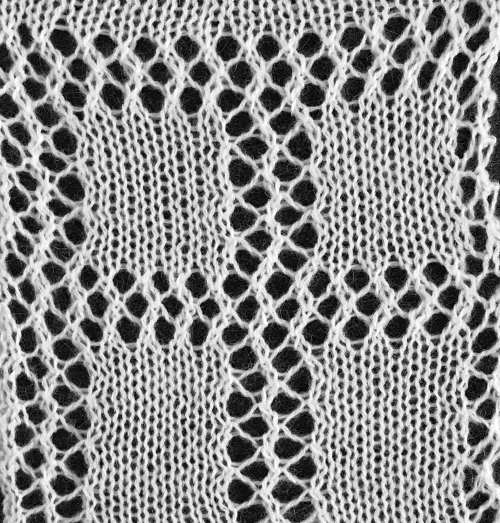 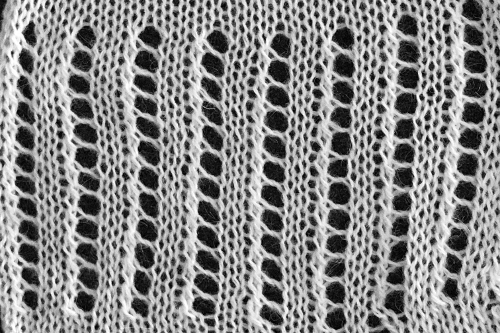 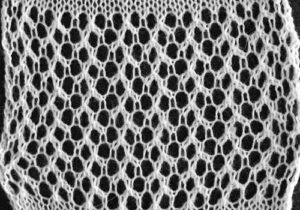 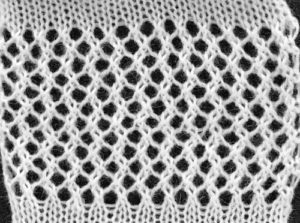 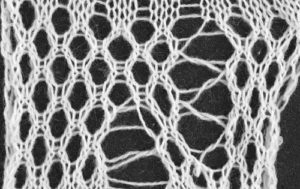 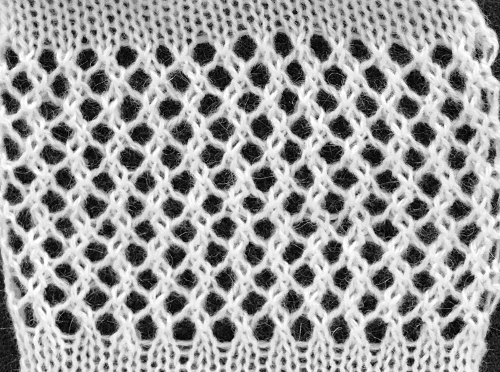 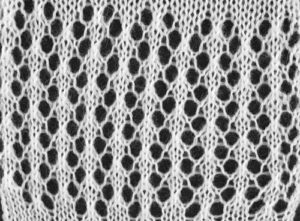 As seen below, the dropped stitches did not result in the frequent large holes often seen in lace knitting. 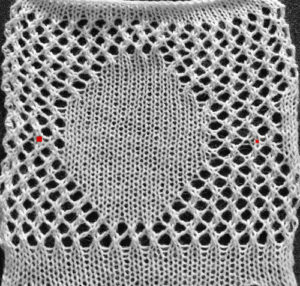 Pins and red dot indicate problem spots, which could be repaired with careful stitching at the end of knitting. 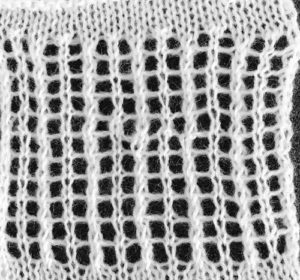 The best prevention of the problem is to visually check after sets of transfers to make certain all stitches have indeed been moved properly. 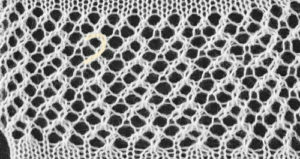 Note: the appearance of the “straight line” edges is altered by the formation of the eyelets along the sides as well as the top of the shape. 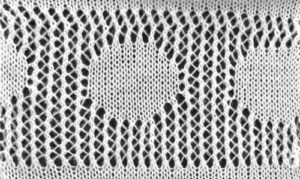 As more shapes are played with, some adjustments may need to be made in punched holes after knitting a test swatch. 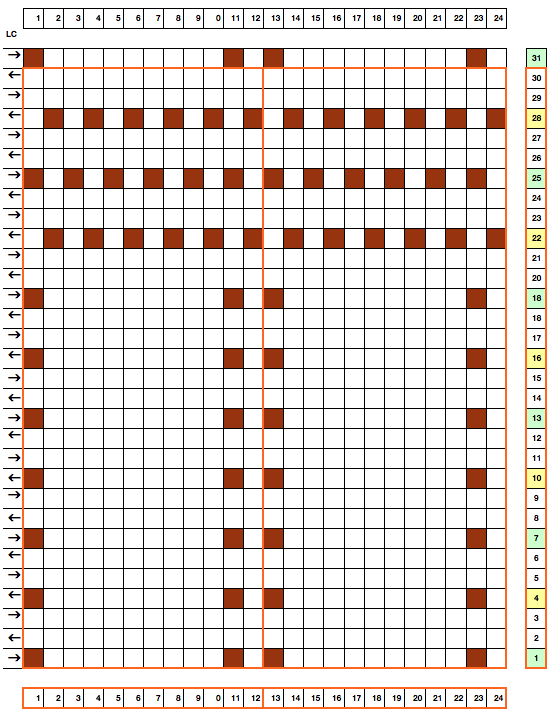 A: is my desired shape 17 units by 17, B: that shape elongated X 2 (17 X 34), to try to approximate elongation with knitting 2 rows for each set of eyelets. 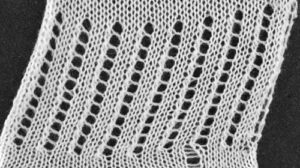 It is drawn on a square, not a rectangular or gauge specific grid however, so if that is a consideration in the design, it would have to be a case of “back to the drawing board”. 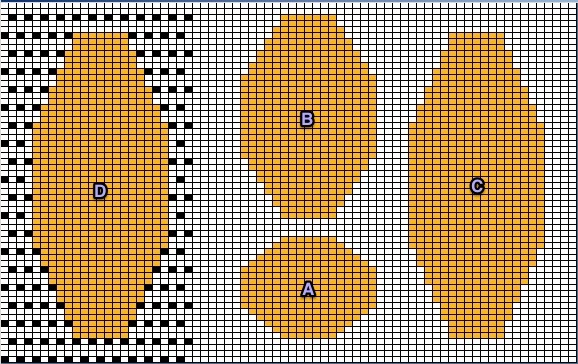 C: the shape elongated X 3 (17 X 51), for placement on the mesh, and D shows it in my desired spot. 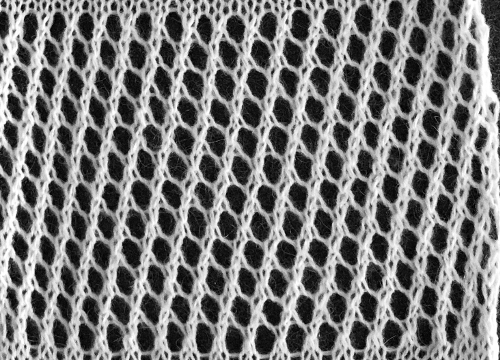 Lace gauge is harder to gauge because of stretch in the final fabric, and the changes subject to pressing and blocking depending on yarn fiber content. 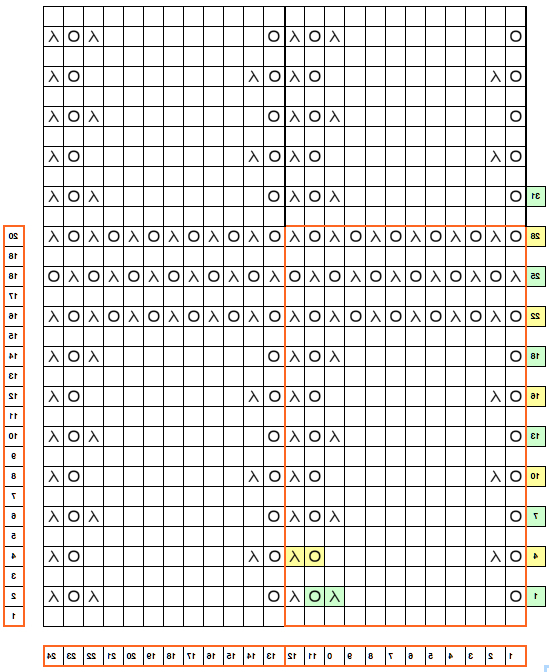 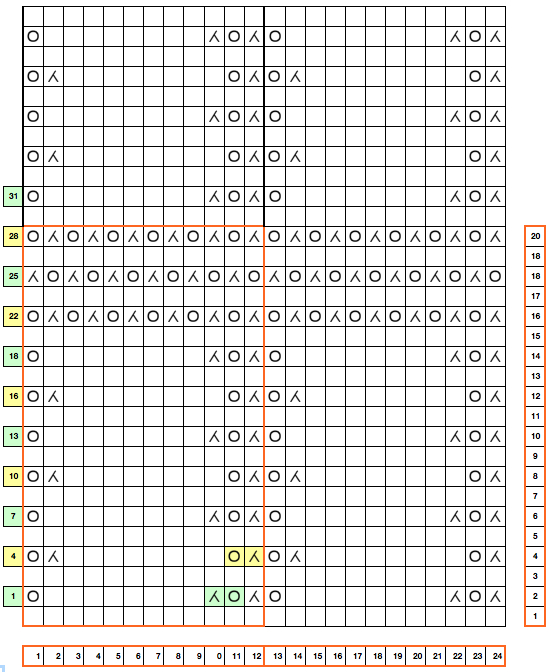 Because transfers in this method occur on rows 1 and 2 to the left, 3 and 4 to the right, no pure straight edges along design borders can be achieved. 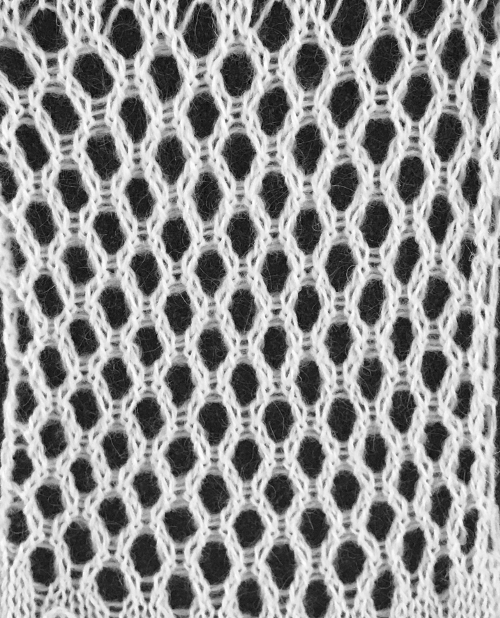 If simple superimposing a large shape on the mesh is possible, there may be even more distortion along those edges. 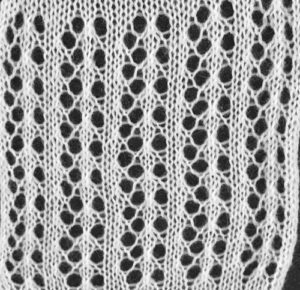 Ultimately a lot of this boils down to personal preference and patience.